You wash your face every night before bed and every morning when you wake up, you apply expensive serums and creams but nothing seems to help your skin. Have you ever thought about treating your skin issues internally not just topically? When your body produces healthy cells, you will achieve happy and healthier looking skin. If you suffer from problem skin, Skin Accumax™ may be the perfect supplement for you. It works its magic from the inside out and by doing so it's able to help clarify each layer of the skin. Adults sixteen years of age and older are able to take this supplement, and are meant to take one or two capsules twice a day with meals. If you want to see the full results, it's recommended that you take Skin Accumax™ for at least fourteen weeks. Is your skin feeling tired and dry? Give Skin Omegas+ a try! This supplement maintains normal skin and vision and also contributes to the normal function of the immune system. Your complexion will benefit from these gels because they have high levels of Vitamin A, which is a key ingredient needed for truly healthy skin. Two soft gels are meant to be taken daily with a meal and are also supposed to be stored below 25°C at all times. This best seller will help keep your skin smooth, plump and youthful. Collagen in our body tends to diminish with age, meaning we lose the elasticity which causes the skin to sag. Skin Collagen Support contains Vitamin C and Vitamin A, when combined helps to maintain your skins elasticity leaving you with beautiful, young looking skin. Skin Complete is a great first step in any skin care routine. Two supplements are paired together - Skin Antioxidant and Skin Vit A+. 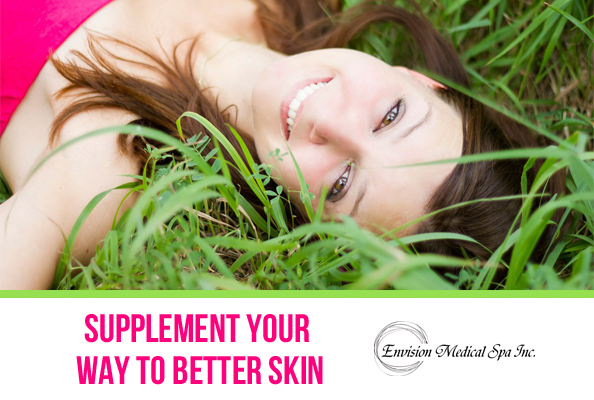 Each of these supplements are jammed packed with nutrients to give you a healthy looking complexion and are much more beneficial than creams and serums that just work on the outside of your skin. This supplement also encourages skin renewal and helps restore your skins overall health. Visit us at #103 5101-50 Ave Leduc, AB or call 780-986-8352 to learn more!